With lawmakers scrambling to keep drivers safer on the road with laws and enforcement, Driver Safety Quotient™ helps commercial fleets develop safer drivers. This online employee safety assessment provides employers and their drivers valuable insight into their natural driving styles along with recommendations for developing safer habits while driving. “We have been using TalentClick’s solutions for over three years, and we are very happy with the results. The assessments are an integral part of our hiring process, and so far we have evaluated over 6,000 potential new hires. Results from the assessments are very insightful and have cut down on the time we spend screening new applicants on the phone or in person. Over the past three years, using TalentClick’s solutions as part of our screening toolbox, our full-time employee turnover rate has dropped by 20%, and our success rate in hiring ‘high’ performers has increased by 25%. 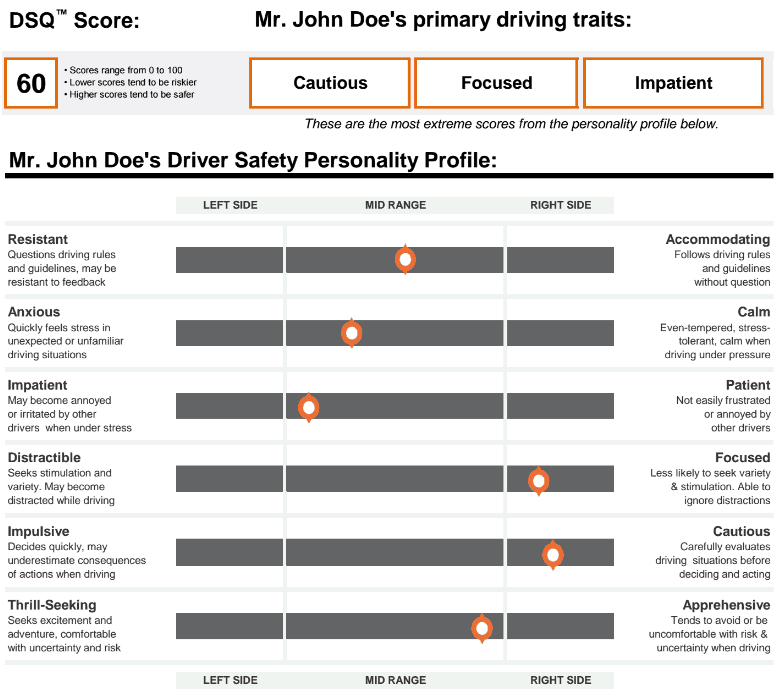 We assessed 339 drivers for at-risk personality traits. Download our study and find out how to identify unsafe behavior in your drivers. A quick way to reduce the number of traffic tickets your drivers receive is to coach for Resistance. In an independent study, Rule-Resistant drivers received nearly 5x more traffic tickets than other drivers. In addition, they were 2.3x more likely to cause accidents on the road. Find out which of your drivers is Rule-Resistant by assessing five of your drivers free with Driver Safety Quotient™.